If you are a prepaid customer of Verizon Wireless then I have good news for you as Verizon Wireless has announced today Extravert Feature phone for you. It is perfect for the messaging lovers as it is featured with a 4-row QWERTY keyboard so you are free to send messages via it and type emails in a matter of seconds. 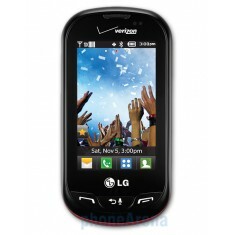 If you are interested in this handset then you can buy it directly from Verizon’s Pre-Paid site for $109.99. Check Full Specs of LG Extravert Below. So would you like to buy it for you? Share with me.